There are so many more experiences at Disney than just rides. I mean SO MANY MORE! 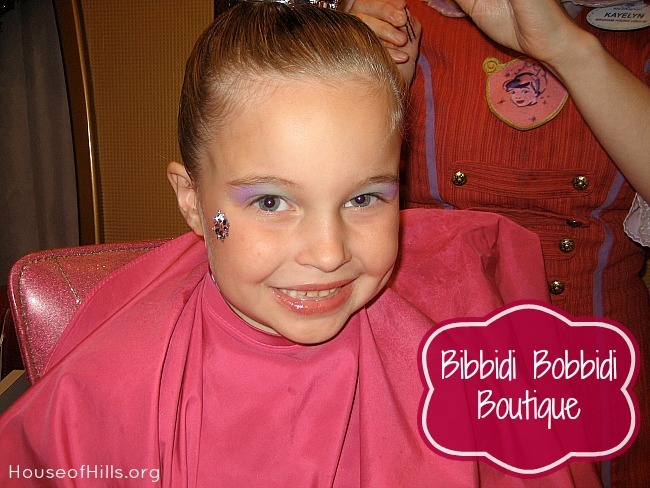 One of our favorites at the House of Hills is the Bibbidi Bobbidi Boutique. 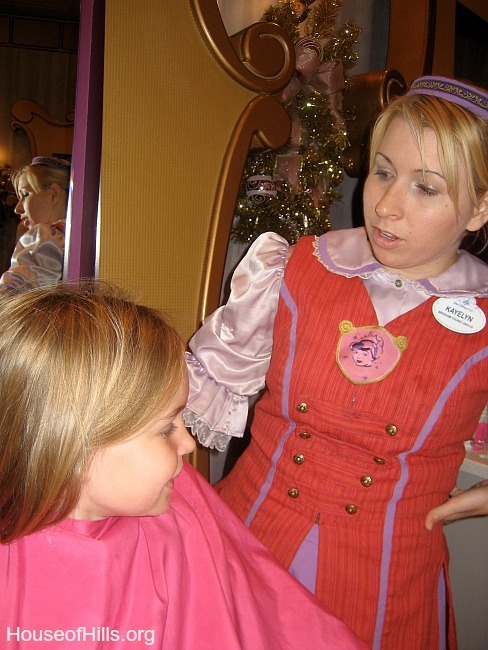 There are actually two Bibbidi Bobbidi Boutiques at Walt Disney World. We’ve been to both. The first one they built was at Downtown Disney. It’s in the World of Disney store on the end closest to the Lego Store. The best thing about this location is that it’s outside the parks. You can make reservations (YES! You need reservations!) for a day you’re not planning to be in the parks or during the afternoon when you’re taking a park break. The other location is in Cinderella’s castle in the Magic Kingdom. The true princess dream is to go to Bibbidi Bobbidi Boutique and then across the corridor to have a meal with Cinderella and the other princesses. That’s what we did in 2007. My sweet hubby got some video. No matter which location you visit, the first thing that happens is a consult. In addition to style choices, there are package choices. They range from simple hair and makeup to a complete makeover that includes a costume and photo shoot. We’ve done all of them at different visits over the years, and all are equally enjoyable. The key is for your princess to know going into the experience which package she is getting to cut down on any drama once she gets there. To see the current package choices and prices, click here. My Princess was able to save her birthday money to get a bigger package several times. Perhaps the grandparents or aunts and uncles can get together and gift your princess with a visit to Bibbidi Bobbidi Boutique! After the package and type are determined, your “Fairy Godmother in Training” gets to work, sometimes with a helper! There are decisions to make about nail color, eye color and lip color. Oh, and you get to take all the extras home. Let me tell you how many of those little palettes we’ve had in our house! 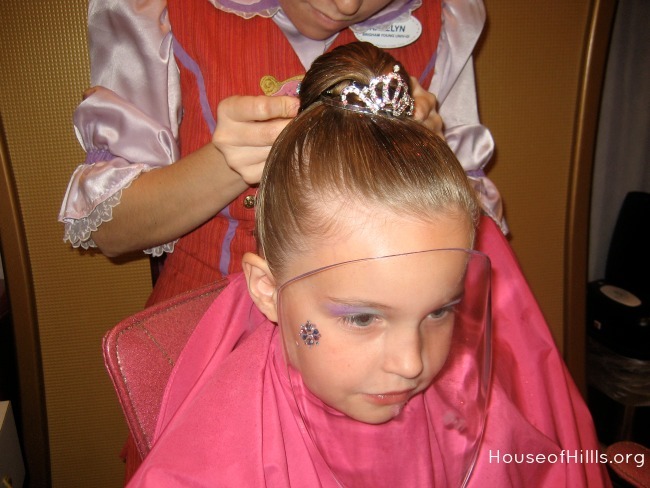 Then, they spray and glitter the hair. 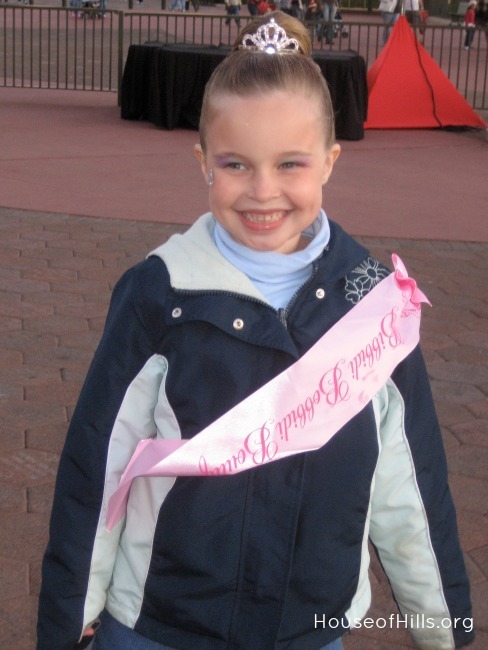 Finally, they add the sash, and you’ve got a beautiful princess on your hands. Be prepared for lots of oohs and ahhs as you walk down the road. We’ve even had cast members bow to our Princess. Bibbidi Bobbidi Boutique. It’s an awesome extra experience if you can fit it into your trip. If you’re going on a day that there is an evening parade, you’re going to want to get in position in the hub while the Castle Show is in progress. And, of course if you haven’t seen it yet, you’re going to want to watch it because every Disney show is awesome. We at the House of Hills have seen every Castle Show multiple times, and we’ve long since quit videoing them because you can google “Magic Kingdom Castle Show” and find WAY better recordings of it than we can ever get. And, um, we watch those at home when we’re longing for some Disney magic. Shhh, don’t tell anyone… we’re kinda addicted to Disney magic around here. Years ago, I started videoing what is really the most exciting thing to watch during the Magic Kingdom Castle Show, my kid (and hubby). Here’s the thing, I’m the only one with the ability to video that aspect of Disney. Anybody can get the show, only I can get the reaction to the show. And, after looking through tons of pictures and video for these 31 Days posts, I’m SO GLAD that’s what I recorded. I cried. I hope you’ll smile. We arrived to claim our spot about half-way through the Castle Show in December of 2008. Mags (age 6) and Daddy are watching, but not entranced, because they’d seen it many times before. I mean they know ALL the words. Then it gets a little cuter. And then we see the actress that we have today. I can’t believe we waited three more years to get her into drama. Do you have any Disney videos that just make you smile inside and out? Whether you’re walking down Main Street, entering a ride, or dining in one of the many Disney restaurants, you will encounter some of the most amazing people on the planet — Disney Cast Members. Yes, they’re called cast members, not staff. Why? Because they’re part of the story. They’re part of the production. They make Disney the place we love to go back to again and again. Yes, I know Disney has developed amazing technology. I know they have thrilling rides. I know their budget is out of this world to create awesome environments people want to visit. But, for us at the House of Hills, that’s not what makes Disney, well, Disney. We go back (and hardly vacation elsewhere) because of the service, the smiles, the helpfulness. We’ve had countless awesome individuals help us at check-in our resorts, navigate tricky lines with a stroller and sleeping child and make sure our bags transferred from resort to resort. We’ve had awesome “Mousekeeping” who always make it magical to return back to the room. We’ve had animals reading, animals watching TV and holding the remote, animals tucked in and sleeping. You never know what you’re going to find. Oh, and don’t even get me started on the towel art. That might have to be its own post. We’ve had countless patient cast members make Maggie’s day with some amazing face painting. 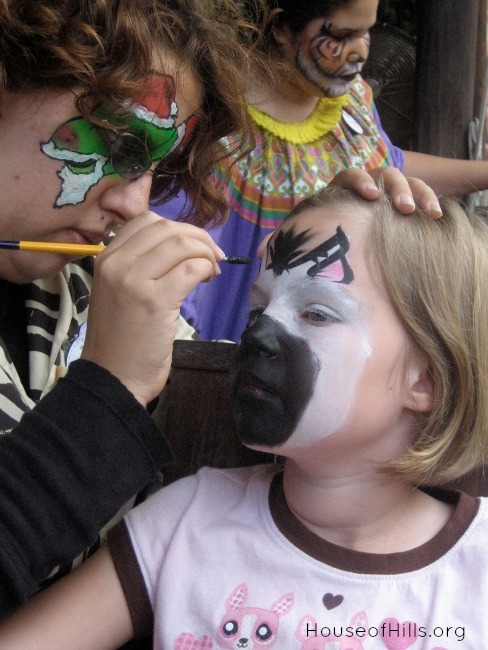 You can find face painting in all the Disney World parks. Believe me, we’ve visited them all. We’ve had tons of laughs (like tears streaming down my face laughs) with the wait staff at 50’s Prime Time Cafe’ at Disney’s Hollywood Studios. If you’ve never been, you’ve got to try it. The food is good, but the improv is even better. It’s especially fun for my drama kid. 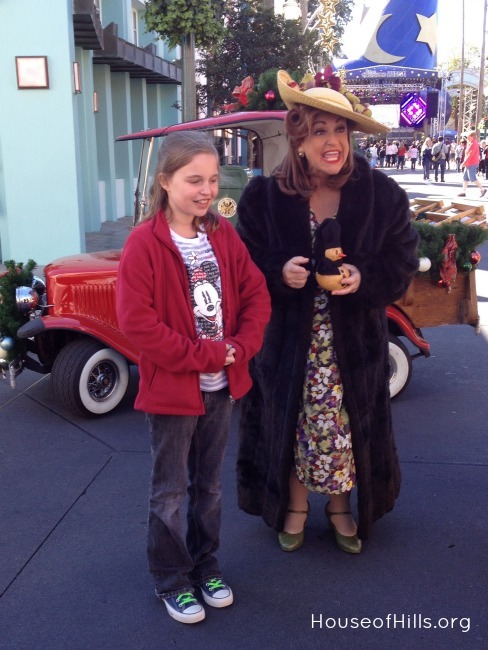 One of the Streetmosphere people at Disney’s Hollywood Studios invited Maggie to sing on the “Streets of Hollywood” after seeing her children’s theater jacket. That pretty much made her day/week/year. We then visited the same Streetmosphere lady and her friends again on a trip a few months later. We swear she recognized Maggie and was excited to see her, but she may just be a REALLY good actress. It’s now Maggie’s dream job to be one of the Streetmosphere people at Disney. 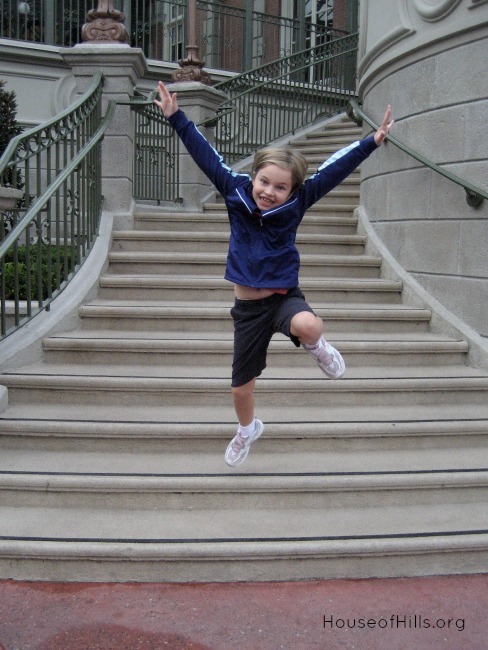 And sometimes, the cast members just make your day because they let your kids be a part of the magic. We had a cast member once let Maggie pull up TONS of tape from the road after a parade. She was three and loved that she was “helping.” You know three-year-old helping makes it take twice as long. But, this cast member just walked along beside her, giving an extra tug when needed. It was the sweetest thing. Then, there was this young cast member who let Maggie hold the rope and direct people to go on a path in preparation for the afternoon parade at Animal Kingdom. It had POURED earlier so the park was pretty empty, and it was a simple job to stand there and hold the rope. But, this guy let her be a part of it, and therefore MADE HER DAY. 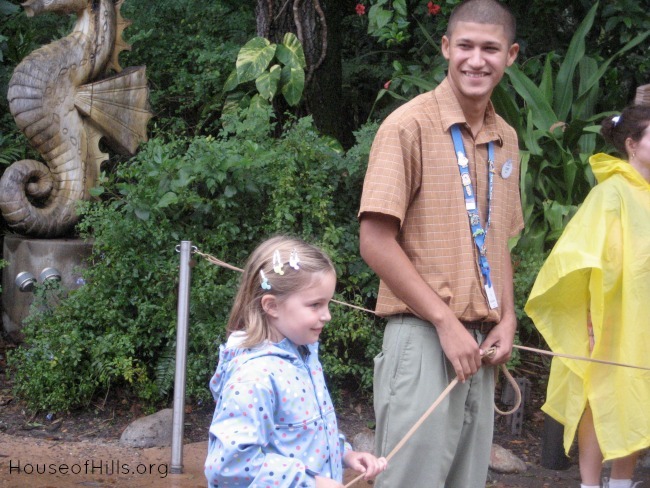 Disney cast member are more than just workers or staff. They are part of the complete package that is Disney. And, we at the House of Hills have a very special place in our hearts for them. Finally, I’ll leave you with this video that Gary Buchanan shared with attendees of the recent Type-A Parent Conference. This lady is awesome and everything I love about Disney. Do you have a favorite Disney cast member story? This is a complex question. Because, I don’t have just one source. Well, my biggest source of Disney news is my husband. He always has a Disney tidbit to share at the dinner table. Like, always. 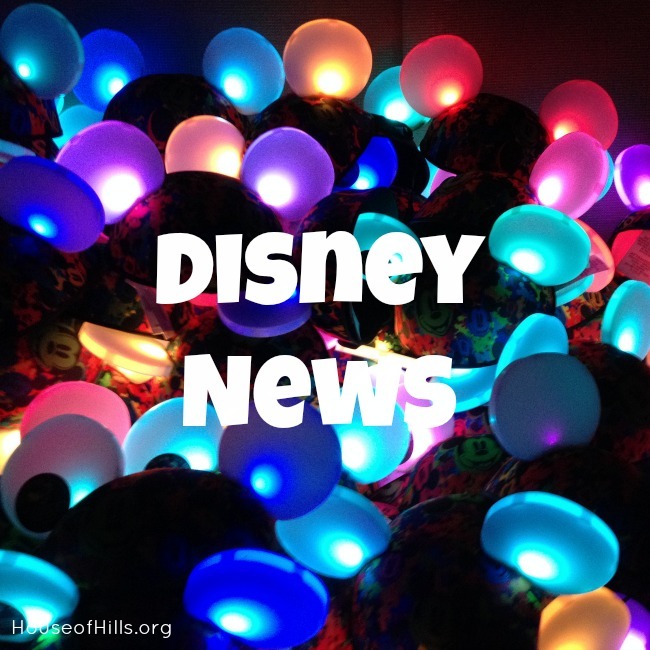 Then, there is the Disney Parks Blog, which is really your first goto source for what’s going on in the parks. I had the opportunity to meet Gary Buchanan at The Type A Parent Conference, and he’s Disney fun personified. My next favorite place to get Disney news is WDWRadio.com. Lou Mongello is a a JOY to listen to and always has fun information to share. He does weekly podcasts and video broadcasts. We actually had him streaming onto our television for the entire weekend during the last D23 Expo (think ComiCon for Disney geeks). Maggie loves him so much that she actually wrote for his blog for a few months before she decided that it wasn’t for her. We had the opportunity to go to one of Lou’s monthly meet-ups when we were at the Magic Kingdom in December 2012. In fact, we organized our whole schedule around that meet-up. Lou’s hugs didn’t disappoint. And, I’m building a Twitter list of folks who I have discovered are good to follow for up to date Disney news. The Disney Cruise Line Blog is AWESOME for up to the minute news of the Disney ships. 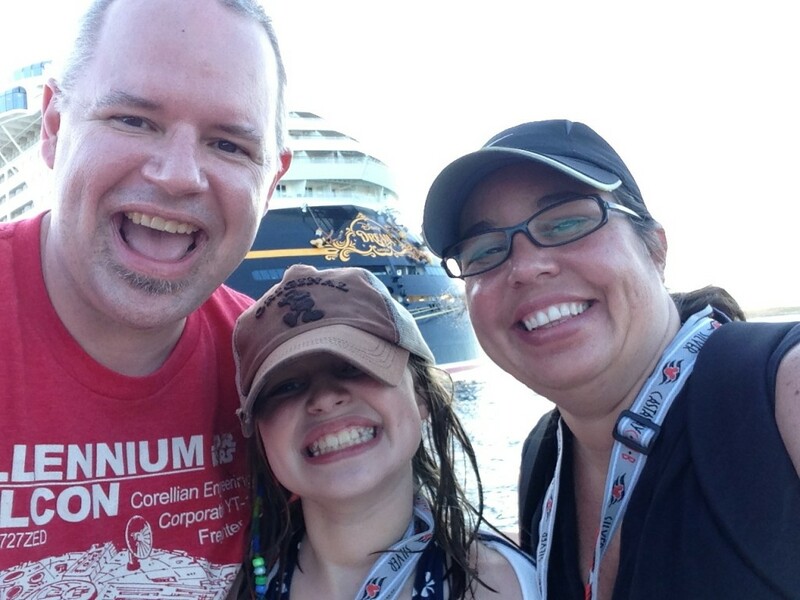 We’ve fallen in love with Disney cruising so like to keep up with what’s happening there. 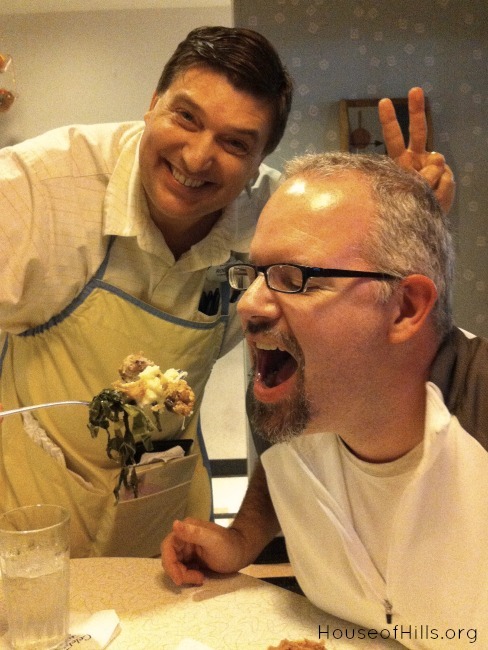 The Disney Food Blog keeps us informed about new restaurants and special food related topics. Since eating is a big part of vacationing, this is important – right? AllEars.net has always been our goto place for dining menus. However, with the relaunch of the actual Disney site, they’ve made much more menu information available. But, All Ears gives a different perspective and is worth investigating every once in awhile. 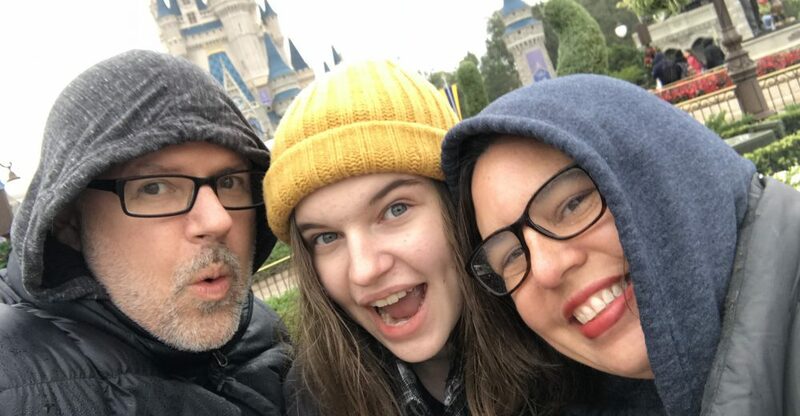 Visit the Disney Parks Moms Panel portion of the Disney website to see questions others have asked and even ask some of your own. Those doing the answering are regular moms (and dads) who have a HUGE LOVE for Disney and were chosen from thousands to be on this panel. I’ve tried for four years and haven’t gotten on yet! Overwhelmed? That’s just a tiny tip of the iceberg as far as Disney news outlets go. Where do you go for your Disney news? 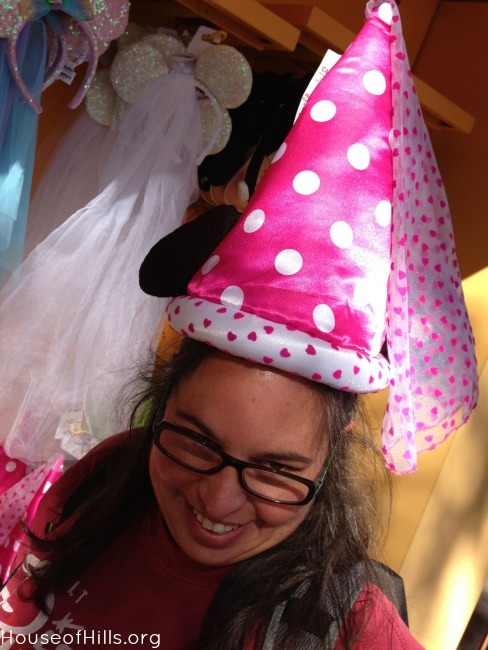 31 Days of Disney: Hats Anyone? A visit to Disney can get pretty intense. People make lists. They make plans. They want to make sure they see everything they want to see. In fact, some people get a little too serious about the whole thing. I’ve seen a woman standing in line with a color coded schedule that made even this type-A a little nauseous. Don’t forget to have fun and laugh about the little things. Like, you know, the hat cart. Then, you might actually go to the hat store and buy the one amazing hat you’ve been saving your birthday money for and wear it everywhere for three days. One of the things we love about Disney is all the fun characters. Everywhere you look, you see someone who just walked right out of a storybook or movie. 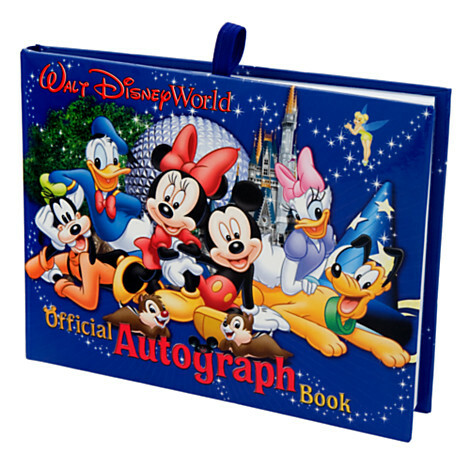 Of course, you’re going to want their autograph so you’d better be sure to bring along your autograph book! 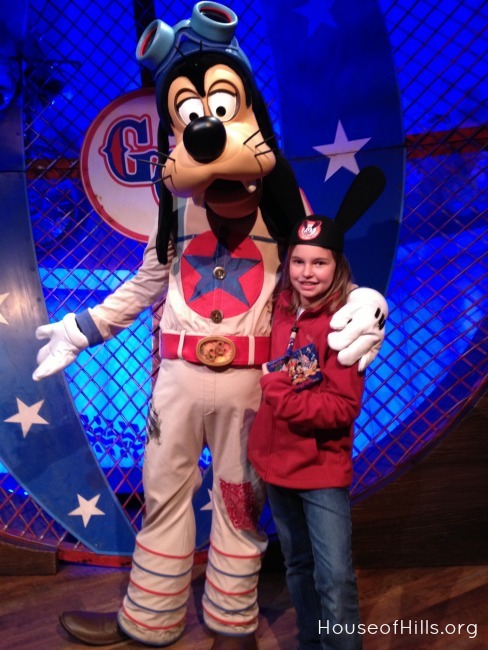 No matter what Disney park you’re in (or even on which ship for that matter), you’re going to run into characters. And, you’re little people are going to want to get their autographs. We seem to have grown out of this need at the House of Hills, but that’s only after filling about six years worth of autograph books. I like to have a different autograph book for each trip. I’m OCD like that. We typically pick up this simple blue one when we check into our hotel. In fact, it is a VERY IMPORTANT first purchase. This blue one is small and fits nicely into our Disney Backpack. It even has a handy ring to hold the pen they sell to go with it. I HIGHLY RECOMMEND getting the big chunky pen too. It’s much easier for the characters to hold. Now, if you don’t want the blue one, they have a myriad of other choices, many of which also contain a place for photos. We ended up getting a Princess one with room for pictures about four years ago. I’ve yet to print the pictures that need to be placed inside. Maybe you’re better at actually getting pictures printed than I am. In that case, the picture one might be for you. You can check out some the different types they sell at the parks here. You could even order it to have before you head out on your trip. There’s no better way to say “Guess what? 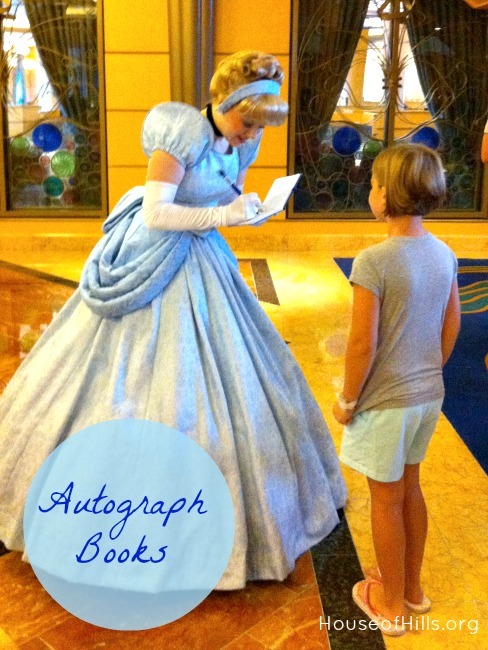 You’re going to Disney!” than give a child a gift of an autograph book and pen. We sorta did that once. 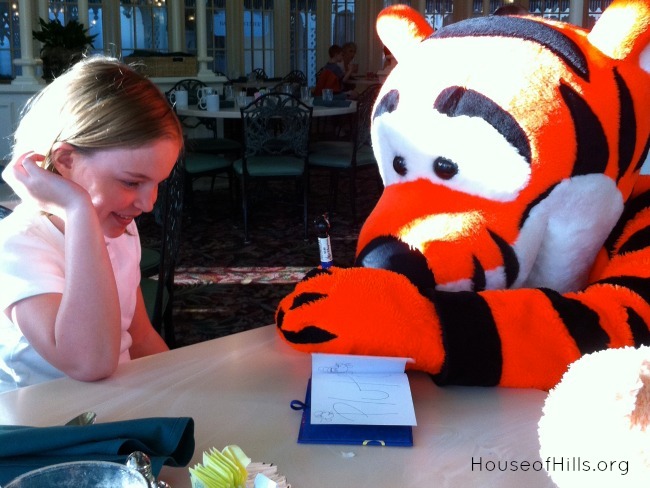 Once you’ve got your kiddos autograph book, you’ve got to find places to get autographs. . Sometimes they’re outside hanging out at their favorite spot. You can look at your times guide or the My Disney Experience App to see where they’ll be hanging out that day. You can also find them at specific restaurants during what is called Character Meals. You’re going to want to have reservations for those meals for sure. In fact, you can get reservations up to 180 days out from the date you want to eat. To make reservations, visit the Disney Website or use the My Disney Experience App. No matter where you find them, be sure to have fun with the characters when you’re getting their autograph. Have them sign the autograph book first. Then get the kids’ picture with the character. Even have dad jump in and be all crazy with them. 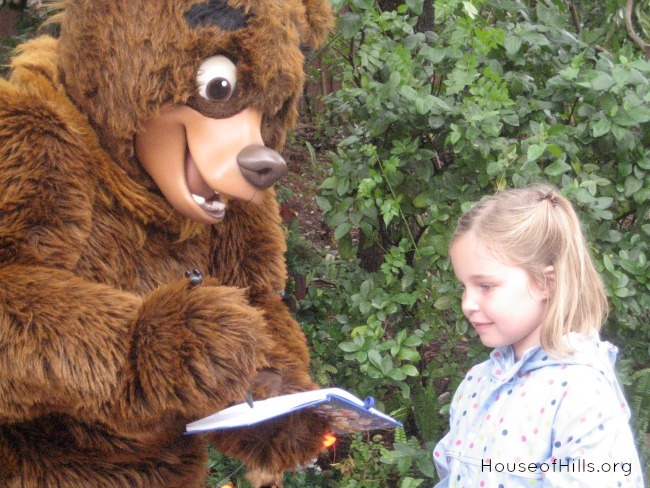 The character REALLY ENJOY interacting with the guests and your kids (and you) will love interacting with them. If you are there during a slow period, be sure to take the time to have fun with them. 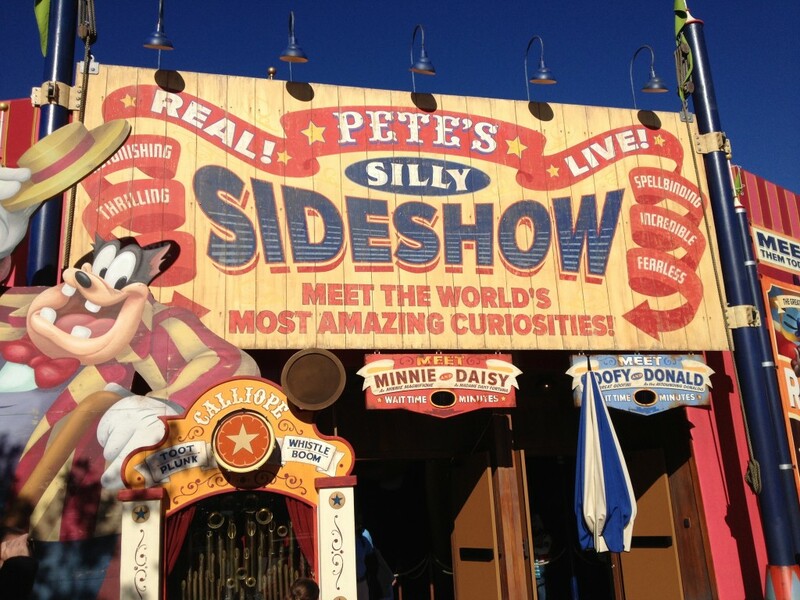 When we went to the new Storybook Circus character tent last year, there was NOBODY in there. We had the best time just goofing off with the whole gang! Let’s dive right in, shall we. We started this magical 31 Days of Disney journey yesterday, and I thought of no better place to start than with the Magic Kingdom. ‘Cause, it’s my favorite. See that castle? Isn’t it beautiful? Sigh. I wish I was there right now. Seriously! Just looking at a picture of the Cinderella Castle brings all my sense alive. I can hear the cast members (that’s what they call the people that work there) greeting me as I walk down Main Street. I can smell the popcorn. I can see all the colors – balloons and shop windows and rides. Oh my! The biggest tip I give people that are going to the Magic Kingdom for the first time is to have someone in their party walking ahead of the kids and turned around so they can capture their first glimpse of the camera on film. I have NEVER managed to do this well. This is what happened when we tried to video it in 2009. As you can see, she was not impressed with my efforts. 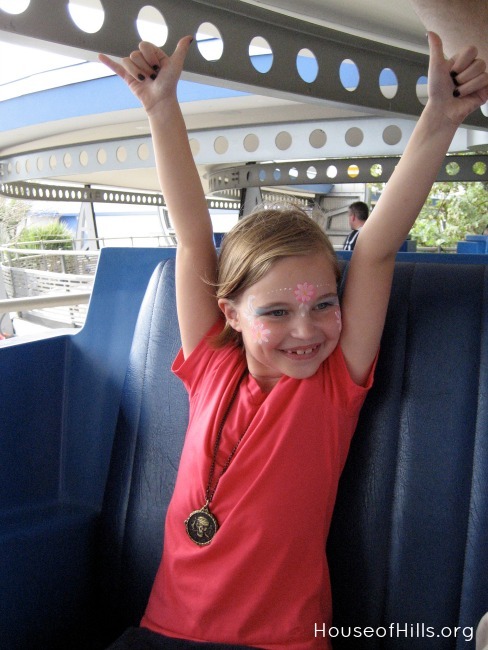 Of course, this was like her 10th time to the Magic Kingdom. We did get this fun picture though. Now, once you’re in the Magic Kingdom, there is SO MUCH to see and do. I could almost do 31 Days on that. Hmmm… maybe next year. Maggie and I had a discussion and we came up with the things about the Magic Kingdom we thought you should ABSOLUTELY know! As you walk down Main Street, you will see Cinderella’s Castle. Did you know every Disney park has a different castle? Little trivia there. The castle is at the hub. It’s like the center of a wheel. Different “lands” surround the hub. All should be visited. All are awesome and have their own personality,quirks and treasures. Your handy map (You did pick one up at the entrance right? You need a map.) will help you determine where you want to go. Maggie’s advice is to ALWAYS go towards Fantasyland first as it gets the most crowded as the day goes on. Another option is to go left toward Adventureland as the majority of people automatically go right. There are so many different rides to enjoy at Disney’s Magic Kingdom. In fact, if it’s your first time going to Disney World, I recommend at least two days in the Magic Kingdom to truly enjoy it. I doubly recommend that if you have kids under the age of eight. The atmosphere is so awesome and engaging that you want to savor your time there and not feel rushed from ride to ride. Enjoy each one. Even the People Mover. This would be one of the least exciting rides in the park, and yet on of my daughter’s favorites. When you (or your kids) get hungry, there are multiple Quick Service restaurants to choose from. Consult your map to find the one closest to your location or choose what type you like. A House of Hills favorite is Pecos Bills in Frontierland for great burgers with a toppings bar like you would not believe. Have a little person that will only eat chicken nuggets? Like we do… No problem! Right around the corner from Pecos Bills (actually out the side door) is the Golden Oak Outpost where you can grab some nuggets. Here’s another tip from Maggie. Get the adult nuggets and ask for entree only so you don’t have to pay for the fries. Apparently, the adult nuggets are better quality chicken than the kid ones. Who knew? If you have younger children, I HIGHLY recommend heading back to the hotel if possible for an afternoon snooze. This is even more important during the warmer months, which is everything except the dead of winter in Florida. Seriously people. It gets hot there. If you’re not able to escape the park all together and have very little people, I suggest taking a break in the Baby Care Center. This gem is tucked near the bathrooms and First Aid center between Mighty Casey’s and the Crystal Palace. It’s a must see if you are changing diapers during your visit. Once you return to the park all nice and rested, you’ll want to check your times guide to see if there are any evening parades (because those are like, the BEST) and what time Wishes is happening. You will not want to miss Wishes. It’s the most beautiful fireworks show I’ve ever seen, and just hearing the opening music (which my husband has on his phone) will bring a tear to my eye. No, I’m not exaggerating. I have pictures of my Maggie watching Wishes since she was in a stroller. Every single one of them is priceless. See what I mean? Oh, I just love that one. Once Wishes is over, it’s usually time to leave the park. Unless of course there are Extra Magic Hours. Ah! What are those you ask? Extra Magic Hours are extended times (either morning or evening) that parks are open to guests staying at a Disney Resort. You’ll want to check which parks have Extra Magic Hours during your stay and plan accordingly. Depending on the time of year, you may want to avoid the park with Extra Magic Hours because it will be the most crowded one, and during busy seasons, that can get a bit crazy. You will want to make sure you have your room key or Magic Band handy so the cast members will allow you on the rides. Maggie would be upset with me (and so would my hubby) if I didn’t make sure you knew a few other things about Magic Kingdom. 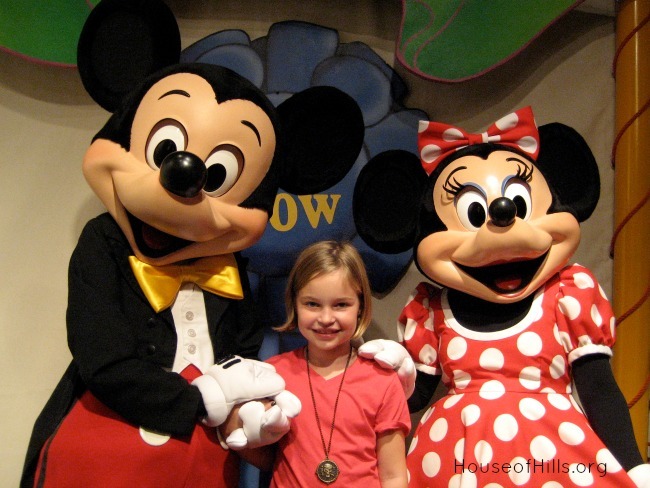 You’re going to want to make sure you get a picture with the Main Mouse himself, especially if this is your first visit. Currently, you can find Mickey at the Town Square Theater on Main Street when you first enter the park. 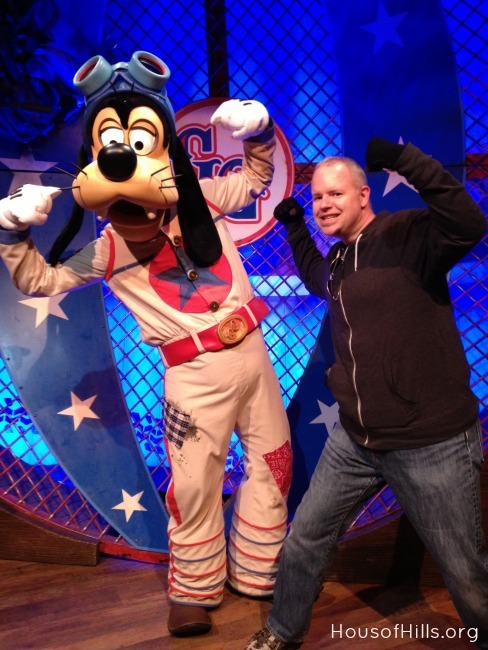 There’s nothing that says, “I went to Disney World!” like a picture with the Big Cheese. 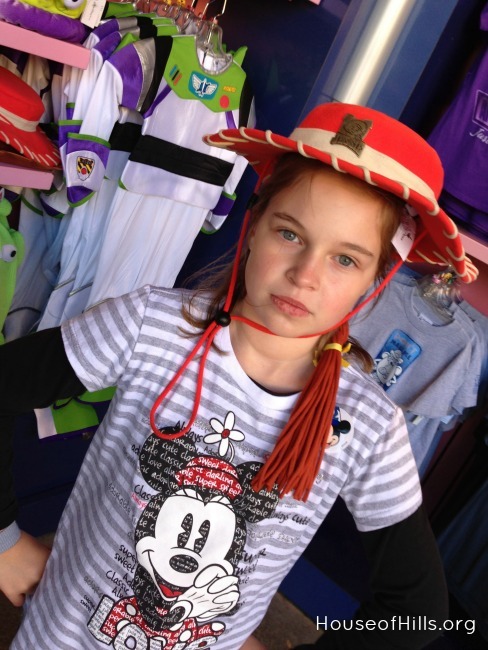 And, Maggie feels very strongly that you should ride Big Thunder Mountain Railroad in Frontierland as it is “the best ride ever.” We don’t remind her that we tried to get her on it for five years before she would even attempt it. Now, it’s over and over again. The Magic Kingdom was created by Walt Disney to be a place where FAMILIES could enjoy time together. That’s what being there is all about… laughing, dancing, smiling, screaming… having fun with your family. 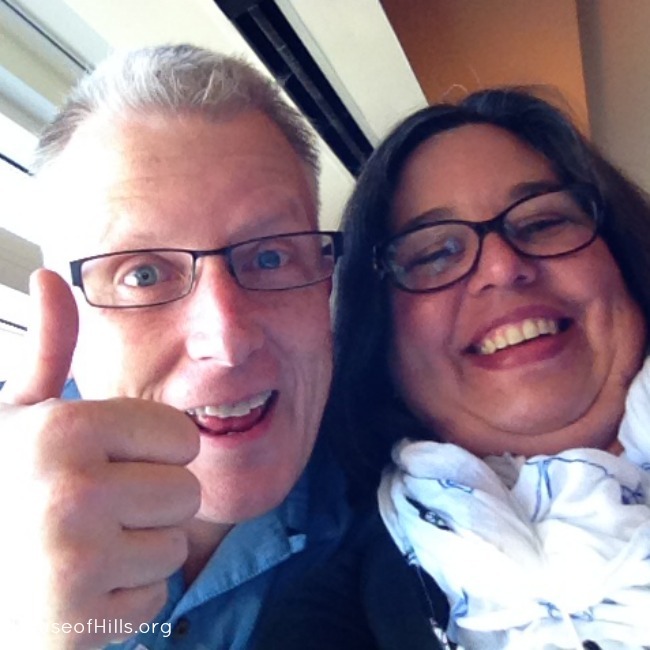 For years, I’ve watched my bloggy friends participate in The Nester’s 31 Day challenge. As in, bloggers write EVERY DAY for 31 days on a particular subject. I’ve always thought, “Hmmm, that would be fun.” or, “Hmmmm, I should do that.” Well, having just returned home from the Type A Conference pumped up and ready to share with you again on my blog (I miss writing for you—the five people who read this—I really do. ), I decided to jump in and participate this year. It’s going to be a fun month! I can’t wait to share my love of the Mouse with you. If you want to see what others are writing about for their 31 Days, be sure to visit The Nester. There are all kinds of amazing stuff. 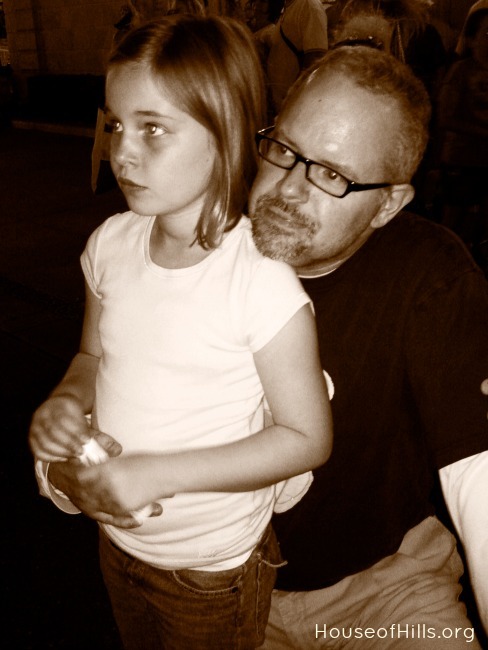 I have found some of my favorite blogs through this challenge in years past. My bloggy friend, Sami Cone (Well, I consider her a friend. We lunched together two years ago at the Disney Social Media Moms Conference and she is awesome. 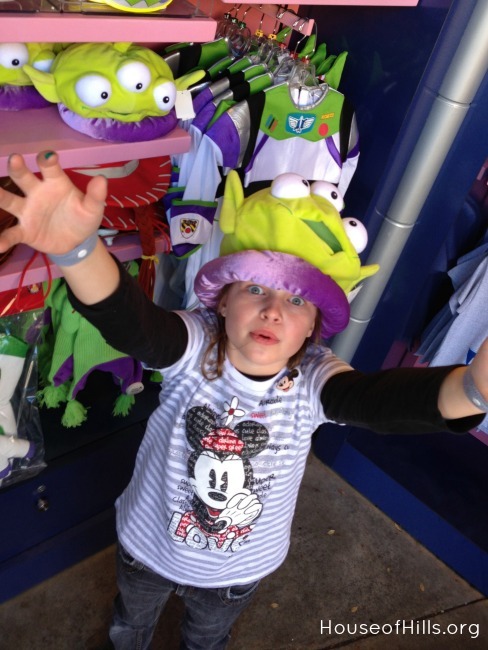 ), is doing her 31 Days on Disney Deals. You’re for sure going to want to check that one out! Is there anything you want me to make sure I cover? 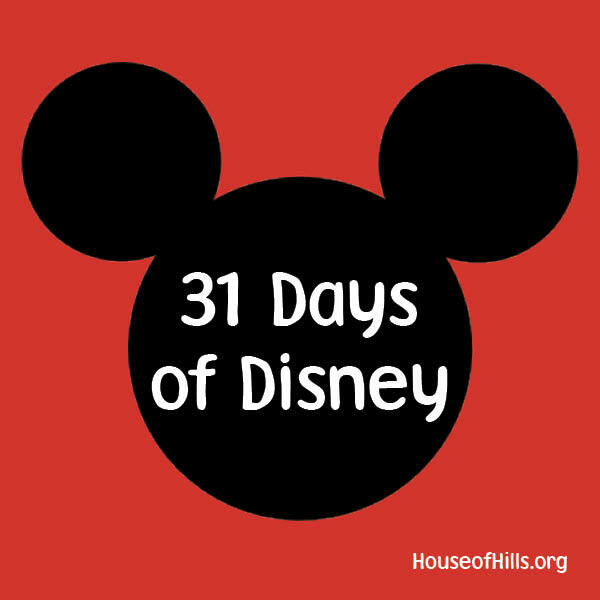 Check back here to see the complete list of 31 Days of Disney posts. I just posted this to Instagram. Yes, my name’s “Kathleen”, but don’t call me that or I’ll think I’m in trouble. Only my mom calls me that… when I’m in trouble. 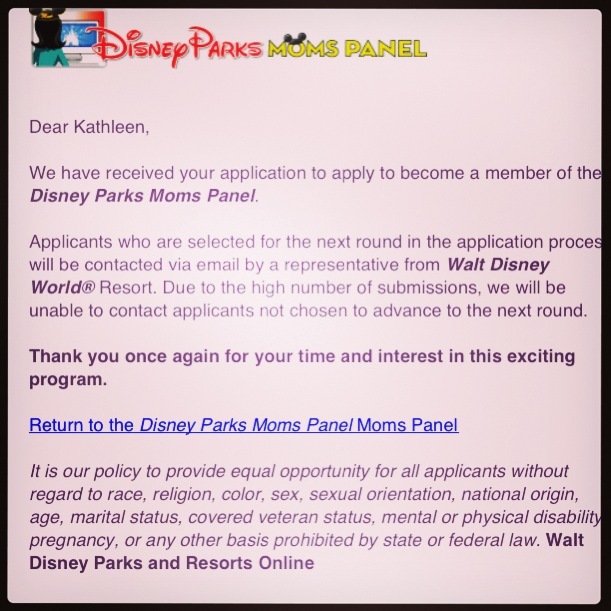 This is the FOURTH time I’ve applied to the Disney Parks Moms Panel. Yes, that’s a FOUR. I applied in 2009, 2011, 2012, and now 2013. Do I think I’ll even make it to the next level? I have NO IDEA! I do know that this time the pool I jumped in is smaller. I applied to specialize in the Disney Cruise Line. That my friends is PURE JOY after an amazing day as a family on Castaway Cay. 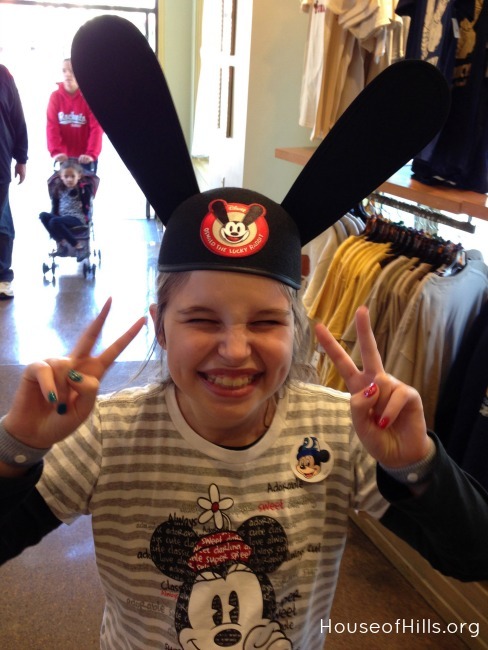 I want to spread Pixie Dust all around so that more families can share awesome times and make incredible memories. So, here’s hoping I make the Mom’s Panel. Or, you can just email me a question, and I’ll help you! 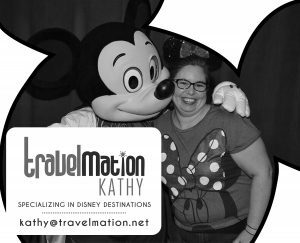 In addition, you can check out the Disney tab and see everything I’ve shared about Disney. 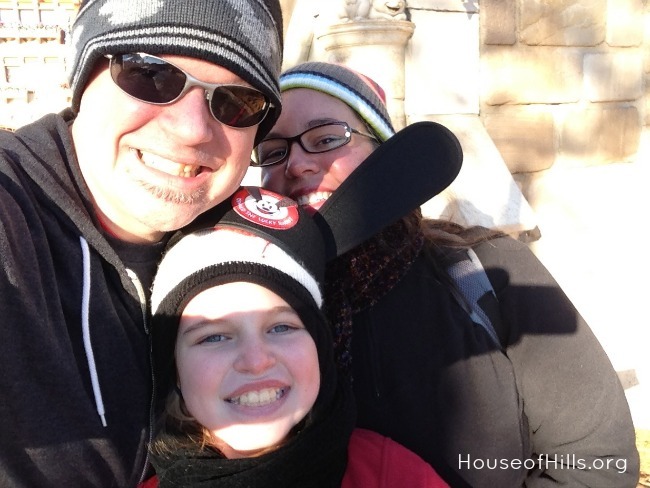 We had an awesome time at the Magic Kingdom this December. 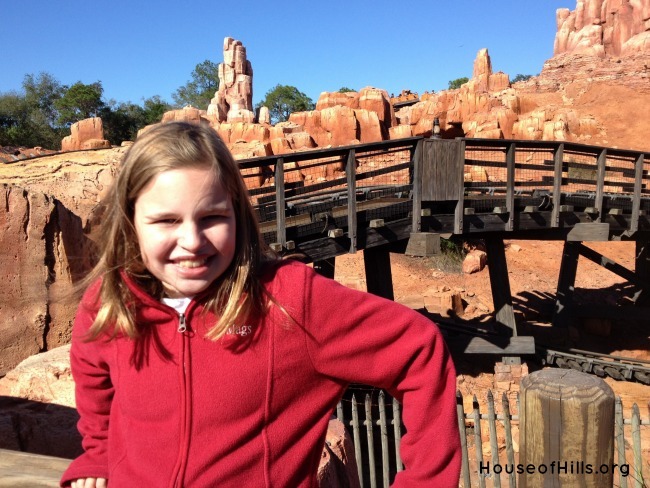 There were so many new things to do in New Fantasyland! The new Ariel ride and Belle experience were awesome, but I have to admit that my favorite part was Storybook Circus. I know. I’m a sap. I just love the fun of a circus. I LOVE the Dumbo ride. And now there are two of them! The best part of our visit to Storybook Circus was Maggie interacting with the characters. They all reside in the Pete’s Silly Sideshow tent. Daisy met us at the door and led us in to meet with her and her friends. The entire family had a good time laughing and getting pictures with the characters. I love that my “little” girl still enjoys getting some character autographs. 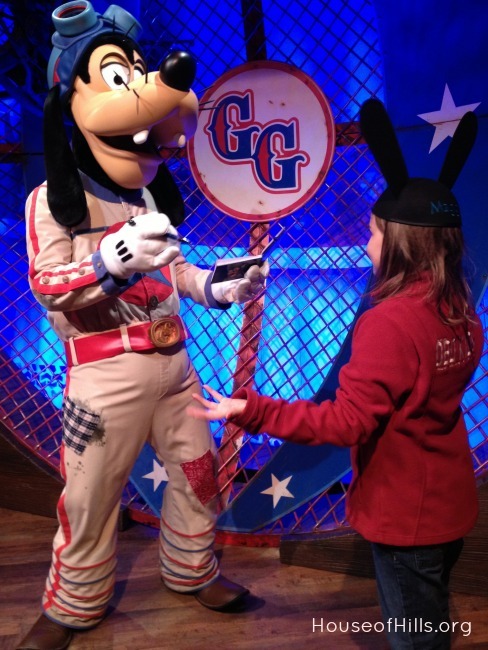 Who is your favorite character at Disney World?